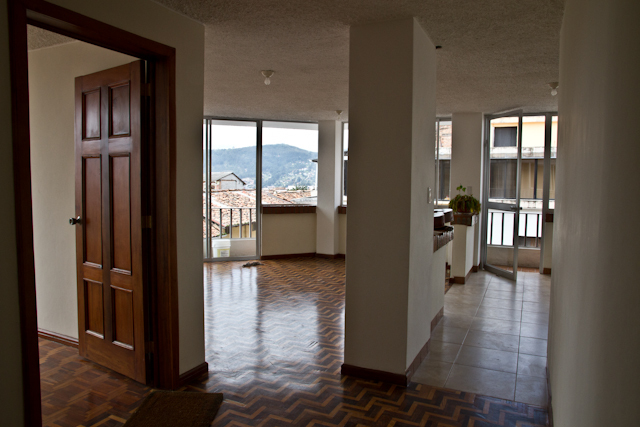 APARTMENTS IN CUENCA - Our "Before and After" remodel of our tiny Ecuadorian Flat! To Move AGAIN or NOT to MOVE!!!!! After moving into Apartment #5 on April 1st, having consistent hot water was not happening! 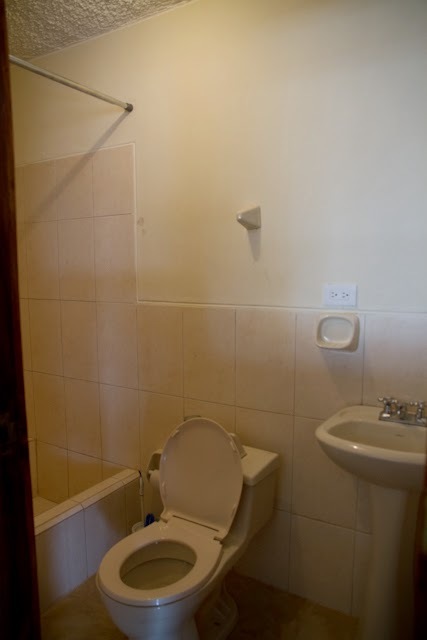 It was the first thing we asked our landlord when we were considering the apartment, and he assured us that "Yes, of course, there's hot water." Well, just because it came out of the faucet hot when he did his demo, didn't mean it would last for a shower, or that it would be consistent throughout the day. So, here we were again - thinking about our next place. I wasn't happy! Bo is fine with taking military showers, but one of my joys is taking looooong HOT showers every day. When we were living in our Motor Coach for a year, I got accustomed to the RV lifestyle, and taking military showers was one of my sacrifices. Well, I'm not in an RV now, and I want my HOT showers. I also want hot water for our dishes. Wah, Wah, Wah. 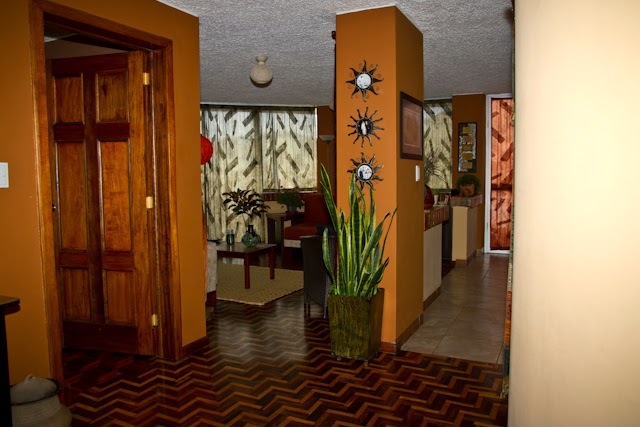 It now was decision time as we paid for our second month's rent May 1st, still considering a recent offer made to us to rent a house near Parque De La Madre. 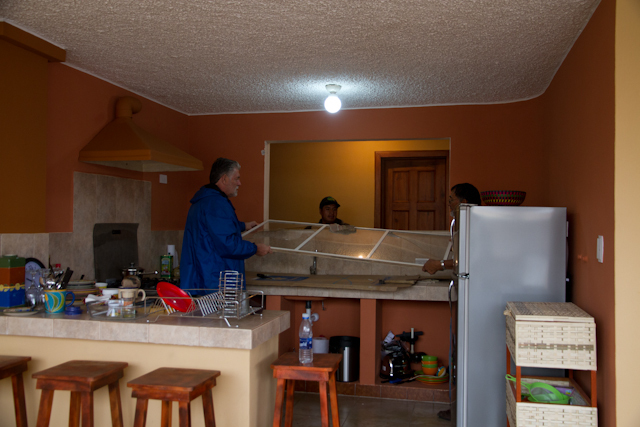 After renting to an Ecuadorian family with lots of children for five years who destroyed their home, the owners wanted to rent to a responsible couple with no kids or pets. We seemed to fit that requirement for them. So, we went and looked at the house and told the owners if they were able to clean it up and fix some major damage done by the previous renters, we would take it. We continued to talk to our current landlord about the hot water issue, and he assured us he was looking into it. Knowing this was not an apartment issue but a building issue, our hope for this being rectified without some major expense on his part gave us two options - live with it or move! The thought of moving again made us both weary. 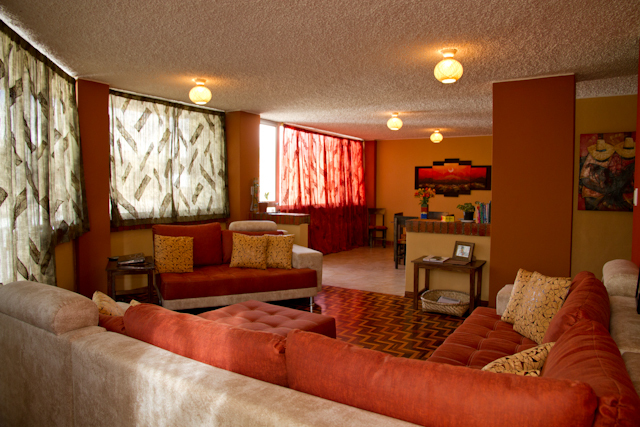 Our apartment was becoming "home" and we had already put some time, money, and remodel effort into this place. We didn't want to move AGAIN, but a two-story house? Leaving my beautiful house of 40 years in Oregon had left a void in me. I missed having a house. This house offer was calling me. We decided we would go and see it again after they cleaned it up and fixed the previous renter damage (I'm talking major cleanup and repair here). In the meantime, we continued to fix up our apartment. Bo reminded me when I asked him if I should put up curtains and continue the remodel since we might move again, "Bloom where your planted!" This is where we were planted for today. To live one day at a time means live in that day and make the most of it. Live in it as if it's your last. MAKE IT GRAND. 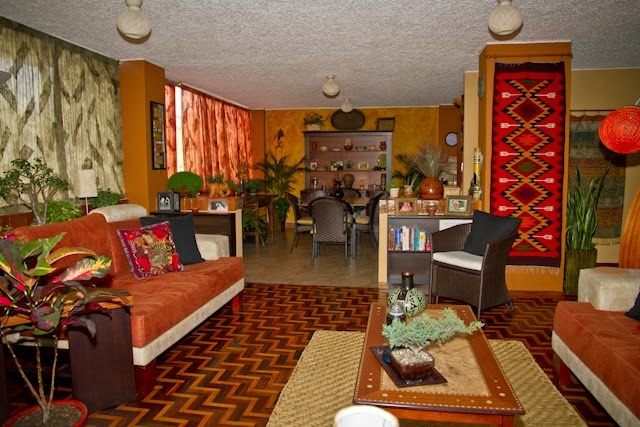 I was also reminding myself that this apartment had truly "WOW"ed us when we first saw it. 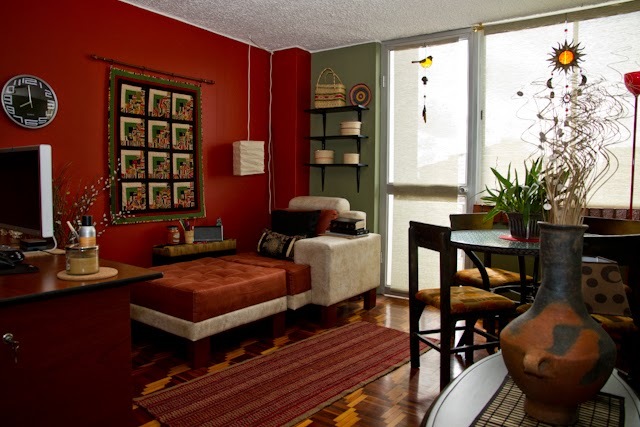 It had such potential for my decorator touch, it was in the perfect location of El Centro for us, and the monthly rent was too good to be true. These were the major reasons for staying here. Could I adjust to the intermittent hot water issue??? We began to have friends over for meals. They would tell us how fabulous our little flat was. I continued to decorate. Bo and I found fun art for our walls. We love art! One of our major decisions in our spending was to do it as inexpensively as possible. We were frequent shoppers at the Rotary Market for our furniture pieces. We continued to put lots of love into our little place, and now it was decision time. In a week, we would go and inspect the house that they were cleaning up for us and then let them know our final decision. Unexpectedly, we ended up leaving for Peru for a couple days prior to seeing the house we were considering. 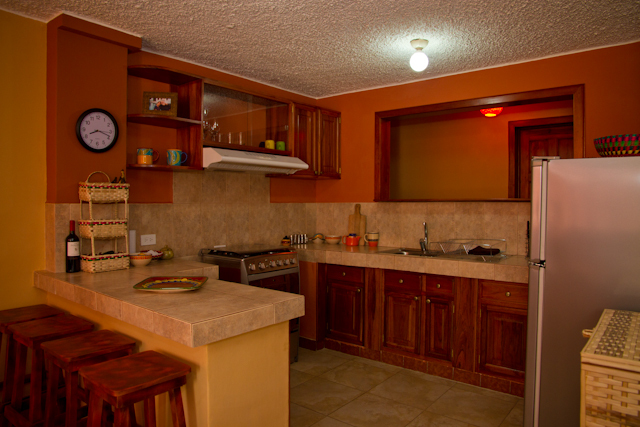 During our three days out of country, our landlord had beautiful wooden cabinets installed in our tiny Ecuadorian kitchen. 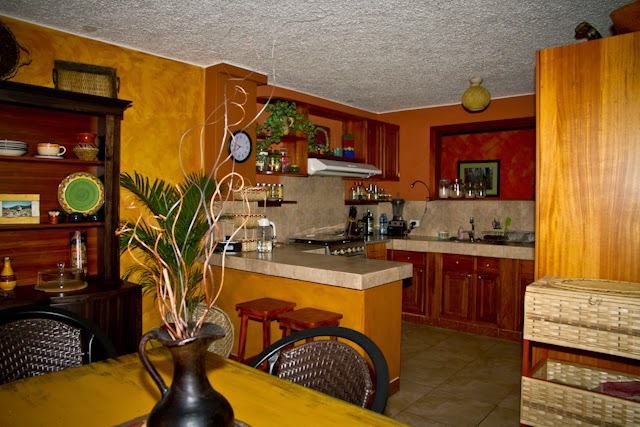 When we returned from our quick trip and walked into our place, we were once again WOWed. 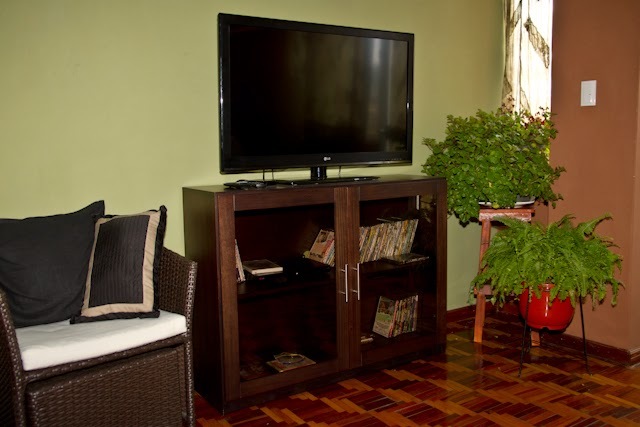 It was a major transformation and it made our humble place even sweeter. I put away all of our kitchen accoutrements and it felt even more like home now. House or Apartment? Now I'm torn. 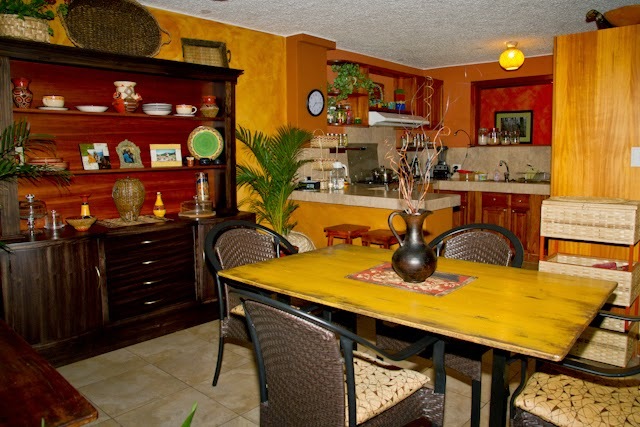 Curtains are up, kitchen is remodeled, painting is completed, furniture is finished. To leave or not to leave? We went to see the house the next day. Our decision became final. Was I disappointed? A bit, but had it not been for our landlord's generosity with that lovely kitchen remodel, I'm not sure what we would have done. It sealed the deal for us. The house was not up to our standards, though they had been working on it for a month. So much damage had been done by their previous renters of five years, and yet they just cobbled together a cleanup and repair job that I personally would have been embarrassed to show as the final touch to anyone. We couldn't even go into the bathrooms because of the strong unpleasant odors permeating from them. 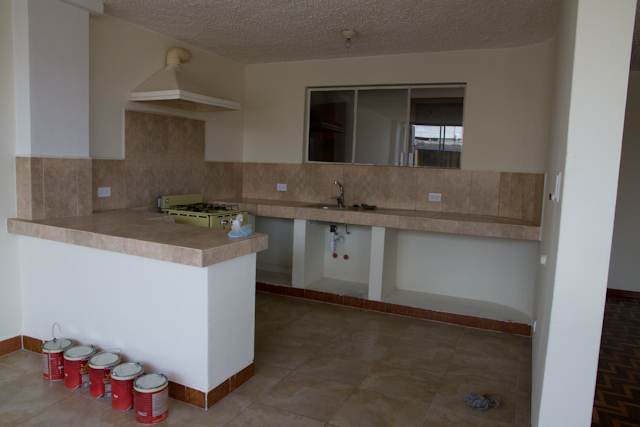 These were things that weren't going to go away, and the work we would have had to put into this house to get it to our standard of cleanliness and living was more than we wanted to tackle or pay out of pocket. It's a rental! 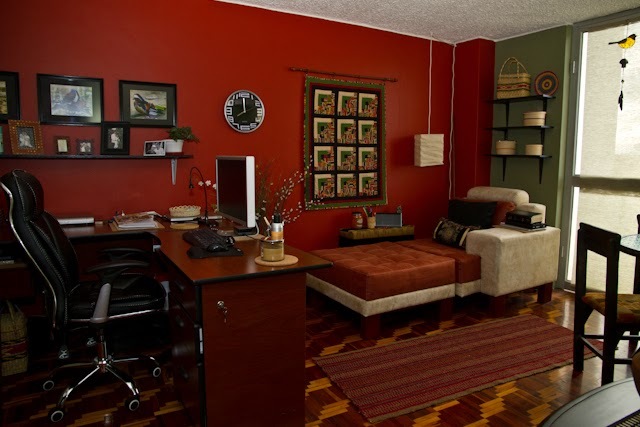 We both knew immediately that we would stay in our cozy, clean, easy-to-care-for small Ecuadorian apartment. 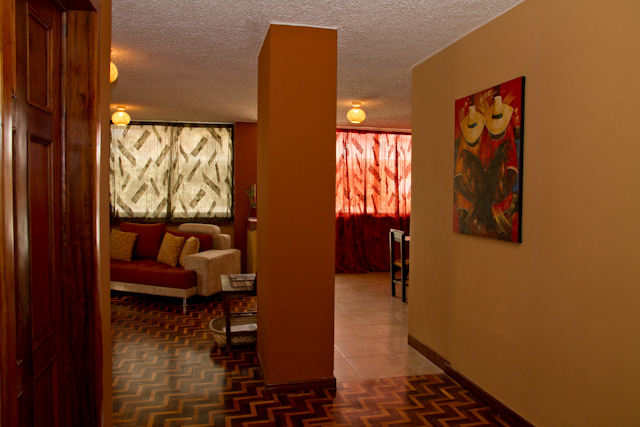 It had become home in less than two months because we made it our home and our Landlord had once again come through. We've learned to make every decision here by the peace we sense about it. We've learned to trust our instinct, to watch for those red flags that begin to wave in our faces. We've made some decision errors since arriving in Cuenca, but they've taught us that "when in doubt, DON'T" and if we're already in a bad decision, GET OUT OF IT QUICKLY! Being in the house did not give us a peace. Being in our apartment gives us peace. I quickly made a decision that I would learn to live with the hot water issue and take military showers if need be. I would wait for hot water to do my dishes. It was the only con. Everything else was a pro. So here we'll be, joyfully and thankfully. 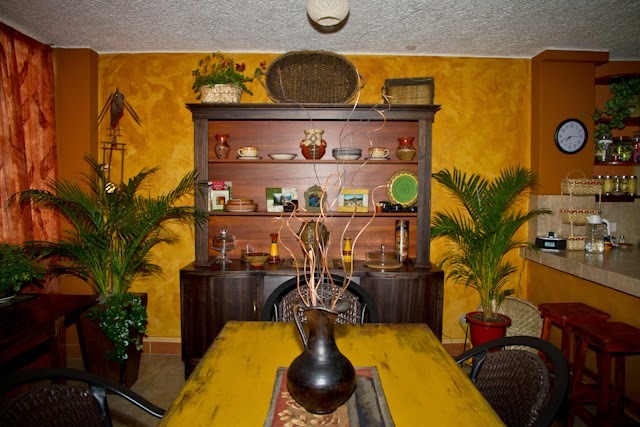 We came home from the house viewing and walked into our colorful place and smiled. It truly has become and continues to become home more and more each day! 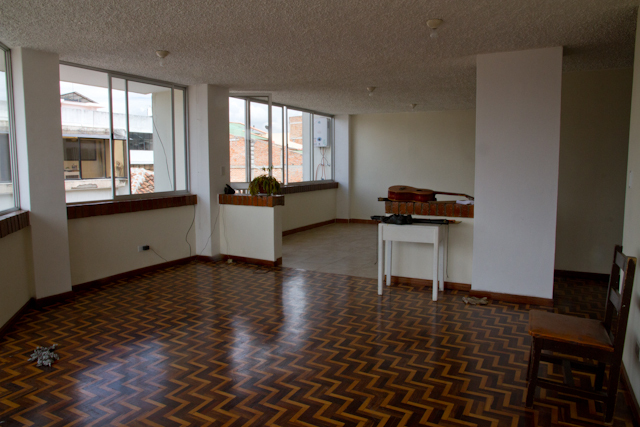 Our Ecuadorian Flat - The Before and After! 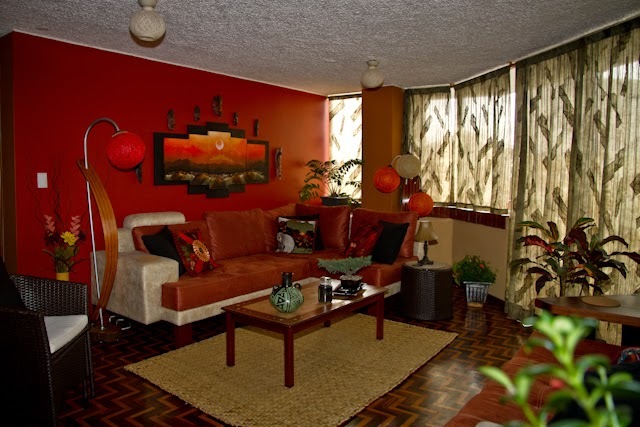 The day we saw this apartment we were WOWed by the windows, the brightness, the openness and spacious feel of this place. I had a vision! 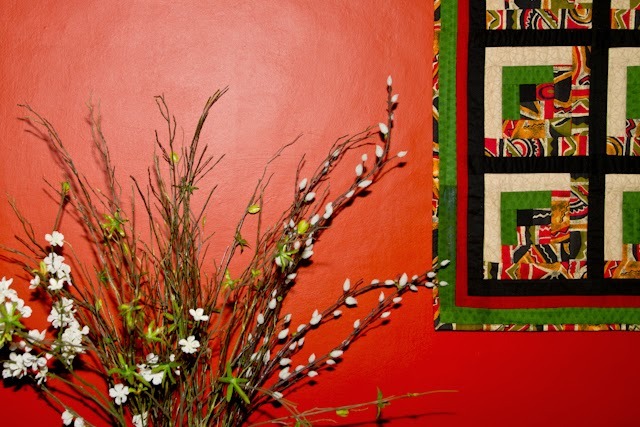 To be creative, inventive, and frugal has always been my way to decorate and transform a place. It's my passion! Our place is still a work in progress. 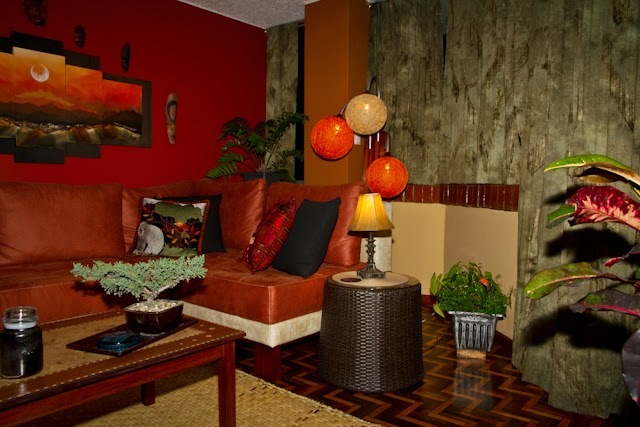 It now has warm colors, fun and funky curtains, comfortable Ecuadorian furniture (a rare find in Cuenca unless you have it custom-made -which we didn't), and some colorful art on the walls. UPDATE: Over time, we've added beautiful plants, art, furniture pieces. It's even cozier than before! 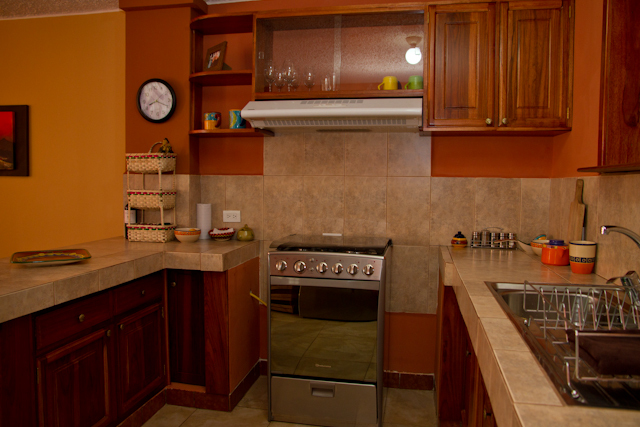 Having a nice kitchen is major for us. We both LOVE to cook and entertain. 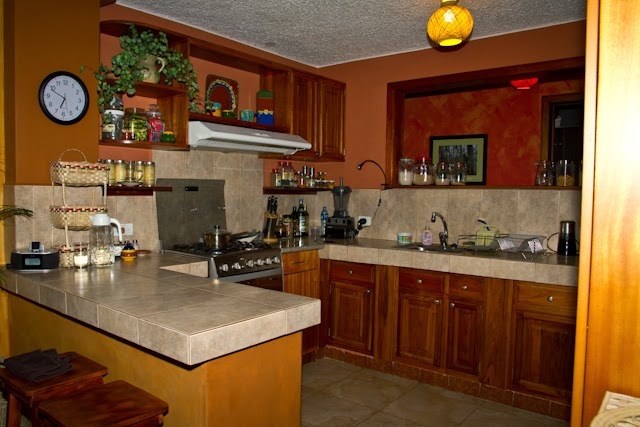 Could I live with this sparse Ecuadorian-style kitchen? There were no cabinets, drawers, shelves, appliances, or overhead stove light-fan. Again, I had a vision. The paint cans were lined up and we were ready to get rid of these boring white walls and turn this into a "Bo and Linda Kitchen!" It takes a bit of money to furnish a place from scratch. 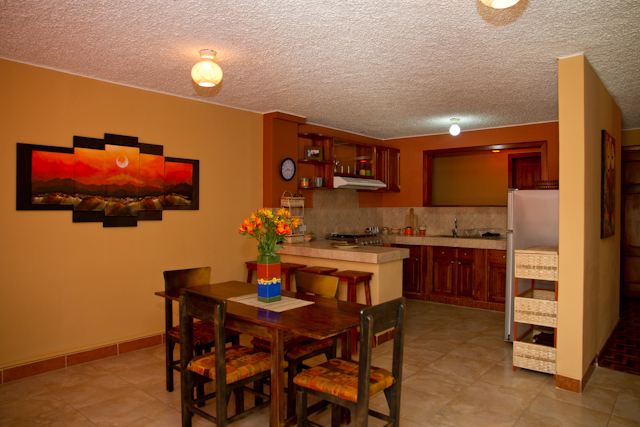 Our four other apartments were already furnished and equipped. 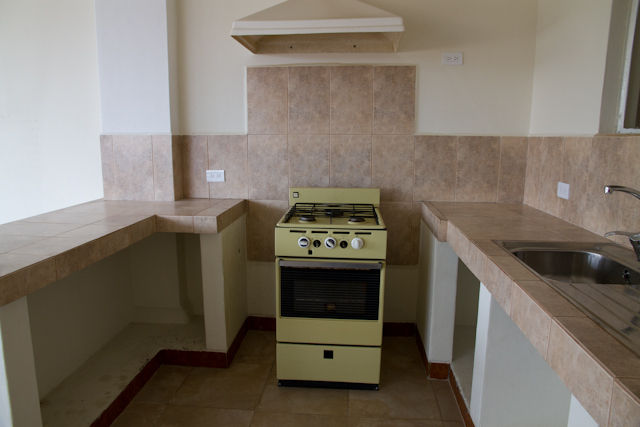 Since we came here with only our clothes - we needed everything: appliances (this ugly outdated stove didn't even work and was hauled away), furniture, dishes, pots, pans, beds, closets (no closets in this flat), etc. We had to buy it all. And we have and continue to - very frugally, but with thought, lots of searching, and with taste. A place that would finally be our style and our stuff, not someone else's. My sweet kitchen today! The window opening is framed with a nice shelf over the sink, cabinets are in, and we have a fan and light over our little stove. My "Bo and Linda Kitchen" dream came true! 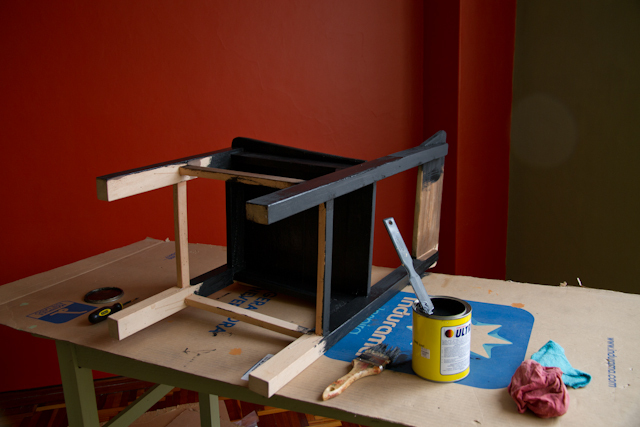 They make very wide openings for larger stoves in most places here, so we want to have some shelves made for the sides of our tiny stove unit and hope to create a bit more counterspace above. For now, this is fine. What a difference from that UGLY yellow stove they hauled away. Update: Side cabinet by stove was made to order! Now we have more counter area and it looks quite lovely, don't you think? Update! 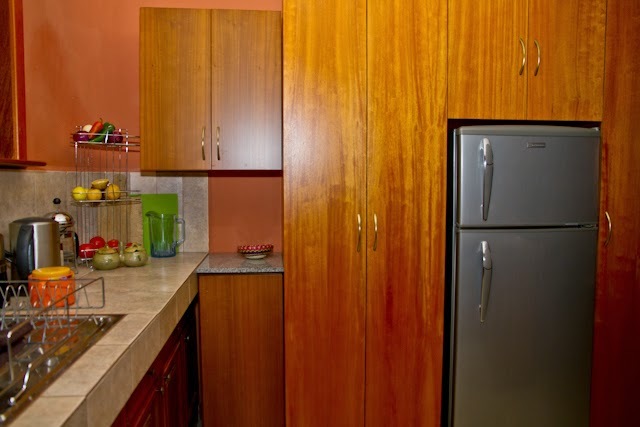 More cabinets were built to order, and it has given us such a sense of organization and much needed storage in this tiny Ecuadorian flat. Update: It takes time to get a place just the way we want it! 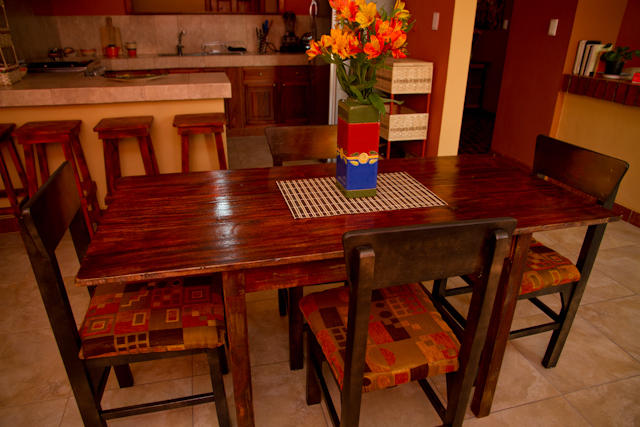 .....But after painting, lacquering, and covering the chairs, and staining and laquering the table, we like it much better! Total cost for our finished dining set: $115. Yes!! 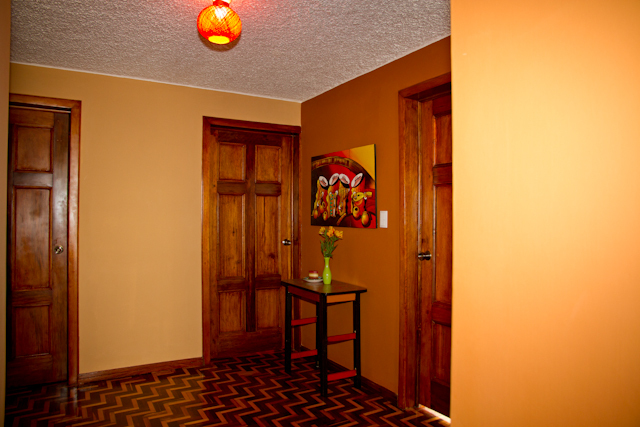 Ecuadorian Apartments do not have light fixtures, just bare bulbs hanging from the ceilings. We didn't want to spend a lot on fixtures and we found these fun hand-made light covers from an artist at the 12 de Abril Art Festival for $5 each. Since we had 11 overhead bulbs to deal with, this price was perfect. Cost: $55. Update: We had to replace our table because it was too small for our dinner parties and English Lessons. We also replaced the chairs because they were not comfortable for hours around the table. Update: We designed this hutch from a photo we found on-line - and a talented carpenter made it to perfection. The bottom of the hutch was a dilapidated cabinet that friends were going to have hauled away from their storage area. I saw it, had a vision, my friends said, "take it" - and this is what graces our dining area now. 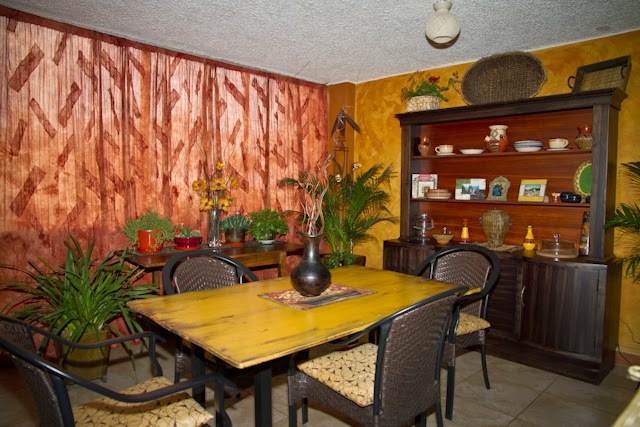 Now we have a comfortable dining area with more storage for our art, photos, dishes, and linens. Below, you can see the difference! Our hallway entrance is now warm and inviting! Update: Photos and plants add more to the entrance. After: Left wall side is sponged! Bathroom - After! Bo built me an over-the-toilet triple cabinet with extended shelving over the sink. 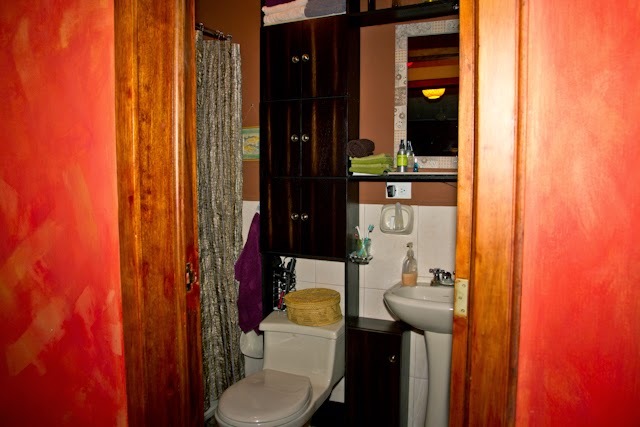 We also had custom-made cabinets for under the pedestal sink on both sides. We added our lovely towels and delicious bath smells and this is it! Update: We decided to change the guest room (sold the bedroom furniture) and made it into a TV room. We enjoy our movie nights. One thing I like about this apartment is that the it is open and the rooms are large. 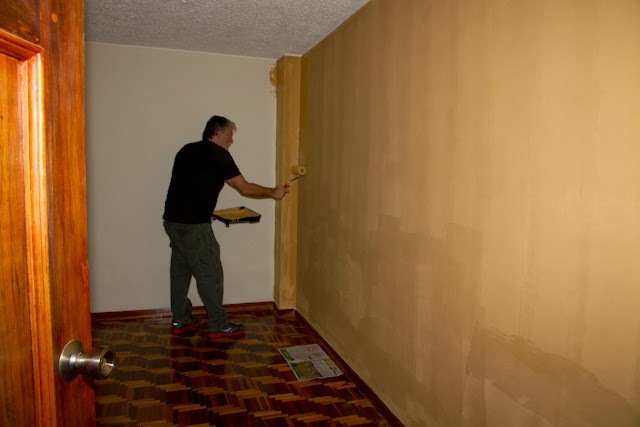 Bo, painting away the white walls in the master bedroom. 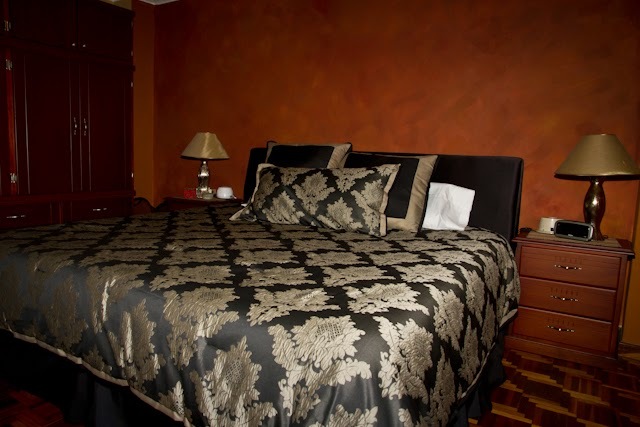 We have a master bedroom room large enough for a KING bed. We also bought a triple length wardrobe (for all my clothes) which we put up against the hall-way window to block out light and sound. It is truly our cave-bedroom - and with two white-noise units on each table, we can't hear ANYTHING! It makes for a good night's sleep. My girl-cave - where I spend most of my hours enjoying my art, photography, and reading. Not one wall left in our apartment is white - and that makes me happy! 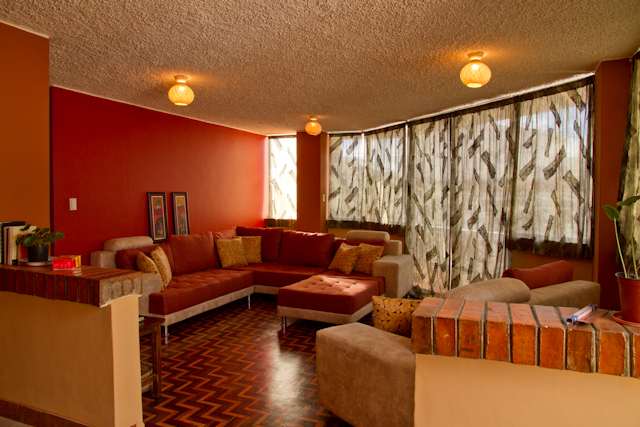 We hope you've enjoyed the "Before and After" tour and recent updates of our Ecuadorian Flat. I'm not afraid of color!!!! Are you?? 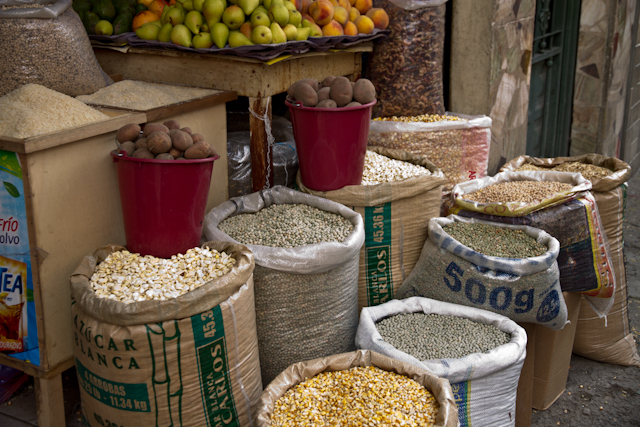 iHerb.com - Getting Mail and Organic Products in Cuenca Ecuador! 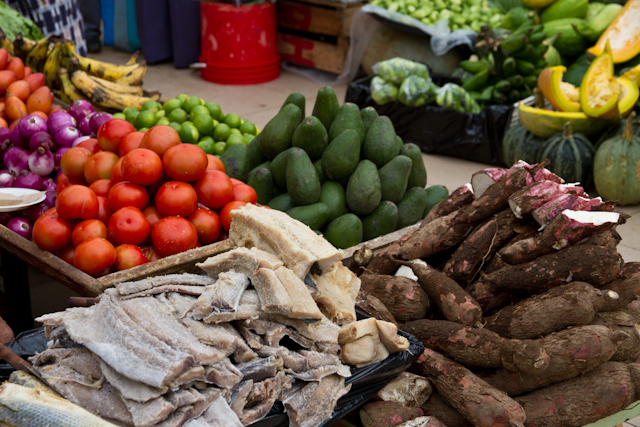 We're still learning how to live in another country and finding inexpensive ways to get organic and wholesome products. Yes, I miss being able to go to some of my favorite stores in Eugene, Oregon, a place that thrives on "organic and wholesome." 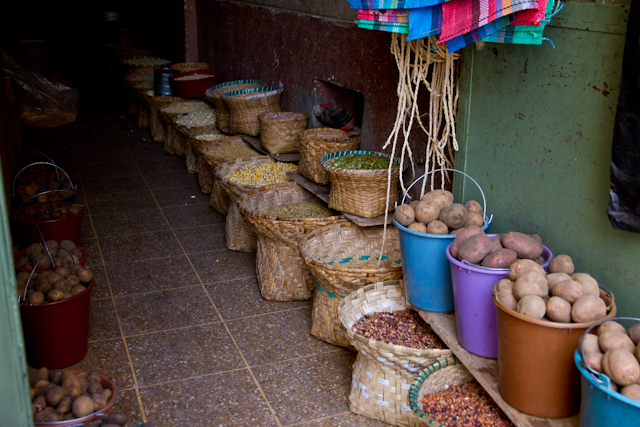 There are shops galore and wonderful sources for wholesome foods and personal care products. Yet, we know that you pay dearly for "organic" in the USA. Especially for produce!! 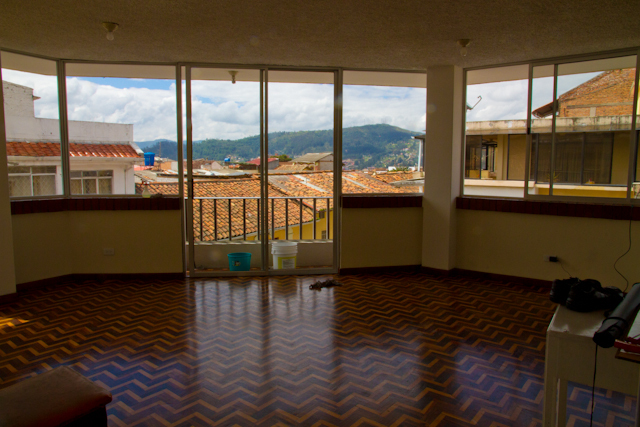 When we first arrived here, we were told that there was a waiting list to get a PO Box at the Cuenca post office. Of course, we never believe what we hear. We go to the source. So, after first settling in to life in Cuenca and trying a couple of other recommended mail sources (Ecuador Movers and Club Correos), we went to the local post office and rented a PO Box. There was no waiting list, and we paid our $22 for the year and got our key and new "Consillero" address. I tried our first PO Box mail delivery by ordering some products from iHerb.com after reading that they will ship to Ecuador via Global Priority Mail DHL for only $4, if the package weighs under 4 lbs. My main order had to be Organic Extra Virgin Coconut Oil because I was paying an outrageous amount here for 8 oz (if I could find it!!! ), and we use LOTS of this wonderful healing product for cooking and in our tea, coffee, etc. 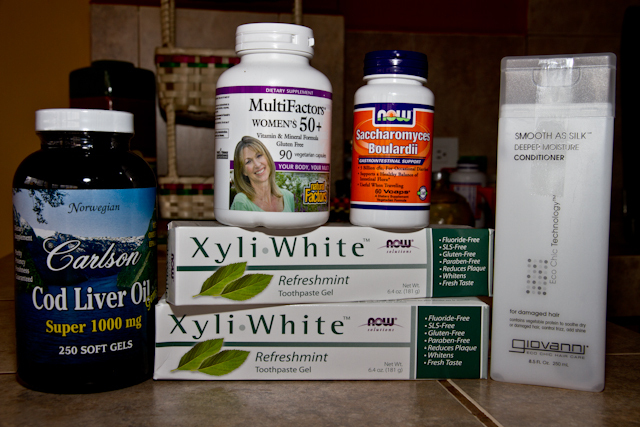 I have also found PURE vitamins and TRUE organic products here to be more expensive than what I want to pay. Enough said!!! 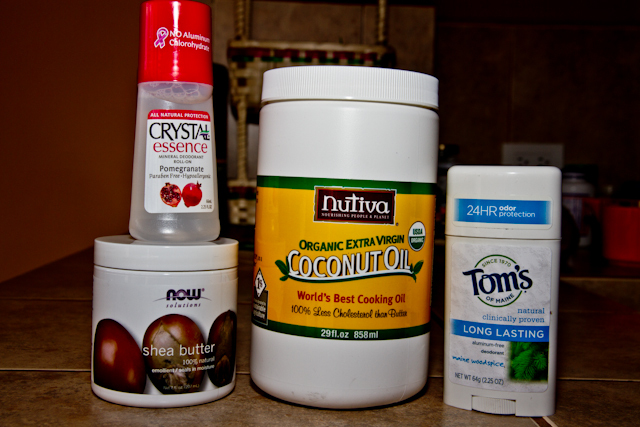 Okay, when I placed my first order with iHerb.com I desperately wanted to get some COCONUT OIL SENT!!!!! Well, my first order was comical. First, I had no idea where it was coming to. I thought it would arrive through the DHL office. I had no idea that their $4 "Global Priority Mail DHL" came to the Cuenca Post Office. When I finally figured that one out, I went to the Post Office window and found out that my package was in and had been there for over two weeks. It took about three weeks total from the time I ordered from iHerb. Everything I ordered was there!!! I was so HAPPY!! (It's the little things that make me happy living in Cuenca - like getting my mail......) Keep in mind, for this low $4 shipping rate, there is NO TRACKING available for your order. Yet, I've never had a problem receiving my orders, to date!! 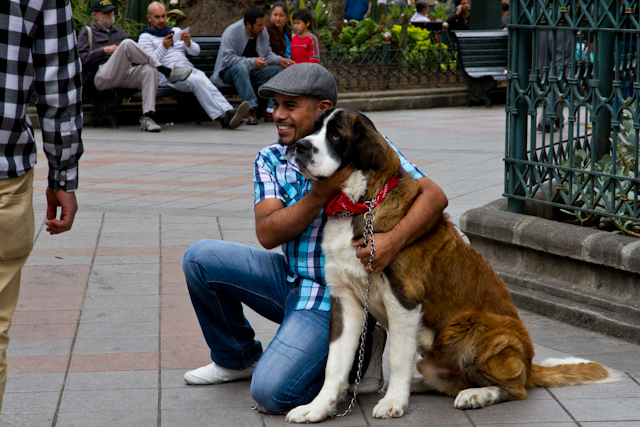 Today, while walking the city of Cuenca, we met up with a couple we know. She began to share with me that she pays way too much for her coconut oil here. Guess what I shared with her??? iHerb.com. Hey, I don't get any kickbacks for this. My whole heart here is to share what I know to be my own personal WONDERFUL experience about living in another country and what I learn along the way. I share the good, the bad, and the ugly (and I believe for us there is more GOOD!!). It's not to whine or complain. It's to help others from my own PERSONAL experiences through TRIAL and ERROR. Bo and I have learned what works for us, personally! Maybe it's not for you - but it works for us. I remember that the first package I received from iHerb.com sat at the Cuenca Post Office for two extra weeks because I didn't know where to pick up my Global Priority Mail DHL delivery. Today, I went to check on my "two packages" from iHerb.com that I ordered on April 19th. They were there!!!! Why two packages? Because I needed several products, and I had to split it up to weigh under 4 lbs each so I would get the $4 "great shipping rate" they offer. Actually, the packages had arrived on May 7th, and I had checked on them on Monday, May 6th. I ordered my product on April 19th. That's a little over 2 weeks!!! I'd say that's excellent for getting mail here, wouldn't you??? I'm happy!!! Today I have wonderful products for wonderful prices. I would recommend to anyone that they order from iHerb.com. By the way, my gift code # is LHK894. If first-time buyers who are reading this place an order and use this code, you get $10 off on your first order. What a deal!!!! Let me know (leave your comments) as to what you think about this company, too, if you do order. It would be helpful to others, I'm sure. I split up a large order, so that each order would weigh under 4 lbs. and our shipping charge via Global Priority Mail DHL would be only $4. I've also learned to read every ingredient (thank you Dr. Caroline for teaching me this) to make sure they are SOY, SUGAR, AND FOOD DYE FREE, GLUTEN FREE, ETC., AND TRULY ORGANIC!!!! This order cost $62.21, which included a discount and only $4 shipping. I'm HAPPY to have floride-free toothpaste, probiotics (they are soooo expensive here) and other wonderful products I am trying out. Ahhhhh, Nutiva ORGANIC EXTRA VIRGIN Coconut oil, 29 fl. oz. for $19. Deodorant that is aluminum-free!!! Wonderful Shea Butter for my body cream. I told you, it's the little things in life living in Cuenca that make me HAPPY!!! Bo always says, "Happy wife, happy life!!!" He's such a smart man, ya think????? This order was $40 with shipping. 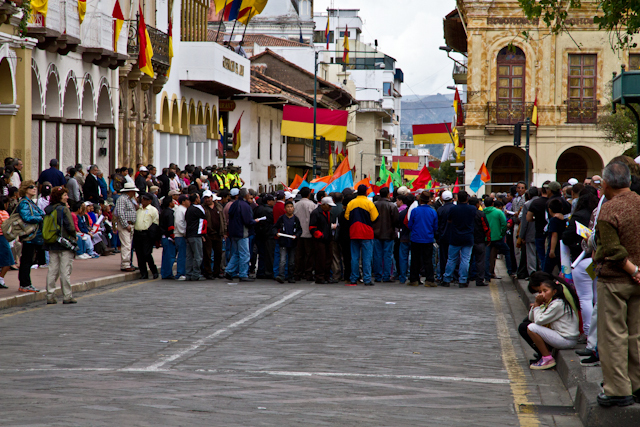 APPLYING FOR A CEDULA IN CUENCA ECUADOR - Applying For Our Cedulas (Part 2) - OUR FINAL VICTORY!!!! Today we showed up at the OFICINA DEL REGISTRO CIVIL in El Centro at 9 am, their opening time. There was already a LONG line formed, but I went immediately to the security guard and he directed us back to the "Cedula desk." There, a young man ahead of us was being processed for his cedula. We learned it was his return visit and he was denied AGAIN! I'm not sure why (I didn't ask), but he didn't seem too frazzled about it. I was called next to the cedula "Hot Seat", and Bo remained talking to the young man, Sheahan, while I sat, prayed, and carefully watched the Cedula "officionado" do his thing. He asked me for my documents (already in order and perfectly prepared by our FABULOUS translator). He then began to fine-tooth-comb them for accuracy (or discrepancies) in our names, quickly checking off our names and information with his trusty black pencil. I was instructed to go to a window nearby and pay $10 ($5 each), receive our "call" numbers, and then go sit in another area and WAIT for our numbers to be called. I did this, and when we sat down in the next area of "waiting," they were on number C62. Our numbers were C88 and C89. So we waited. 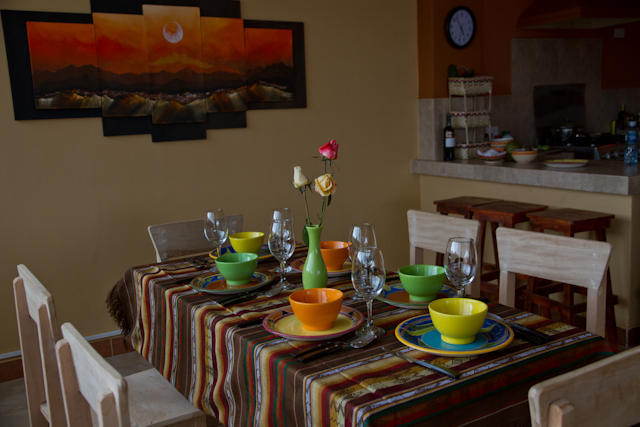 An Ex-pat couple living in Vilcabamba approached us to ask some questions. Come to find out, they had been waiting 1-1/2 years to get to this place. I couldn't believe anyone would have that long a wait to get their visas and Cedulas processed - but this was fact! It made us feel like our process of the last 4 months was a BREEZE!!!! Finally, they called our numbers. Bo was taken to one booth and I to another. My first concern was, "Bo can't speak Spanish. How will he do this???" Well, I had to let go. Bo was on his own! Mr. Cedula Man went through his document routine with me, including asking me if I wanted to be an organ donor? "No. I do not!!" He smiled. I immediately wondered, "Is Bo even understanding this rant?" Probably not! (Bo is now an organ donor!!!) Mr. Cedula Man finally finishes up with me and then proceeds to tell me to remove my ear bling, my eye glasses, and to put my hair away from my face and forehead and tuck it behind my ears (really???). When he takes the photo and I see it, I cringe. It's the picture of an FBI most-wanted woman criminal. I gasp. I tell him, "Muy feo!!!" He laughs. Not funny! Why in the world would they want to make me look like such a ghastly horrible sight??? He proceeds to tell me to return in two days to pick up my Cedula. At this time, Bo is also finished. He tells me that he's to come back in three days. I question him. He also tells me that they have put my name down in his Cedula info as my previous married name. No!!! I quickly return to Mr. Cedula Man who processed Bo's papers, boldly interrupt the person he is now helping and say, "Excuse me, but when does my husband pick up his Cedula?" He replies, "Two days!" I then add, "My name is Longood, not _________?" He assures me that they always use the name that the spouse entered into the marriage with which is on the marriage certificate. I don't buy this at all, but I decide not to question it any further. Why bother, I tell myself? They will do what they want anyway. We both walk away! On Thursday, we will return and pick up our final Cedula ID cards. It's over! We did it! No more paperwork! When we left the Cedula office, we headed for the Whitehorse Cafe for a celebratory breakfast and then to Cafe De Nucallacta for more delicious ice-cold frappuccinos and toasting! It is such a relief - a huge weight off our shoulders knowing that this is the final and last step that we have been waiting for. There are so many ex-pats who are just beginning their visa process - many who will have unhappy or difficult stories, and some who will breeze right through it. Eventually, most will have their story of victory and will finally walk away with their Cedulas. Today, after many challenges in our 5 months here, we finally have our long-waited-for victory. It Is Finally Finished!!!! CELEBRATING OUR CEDULA VICTORY AT CAFE DE NUCALLACTA!! 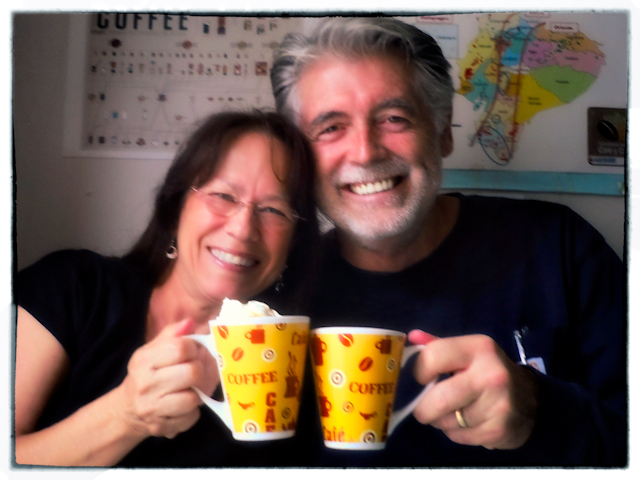 After we left the Cedula Office we went out to a celebratory breakfast and then spent time at our friends' Rumi and Melissa's Cafe De Nucallacta sipping their delicious "FRAPPUCCINO" drinks and toasting to our final Visa-Cedula victory process! Were HAPPY!!! One thing that make me happy about living in Ecuador - Seeing beautiful children playing! Three beautiful children play along the San Francisco Markets' streets, while their parents sell their wares. 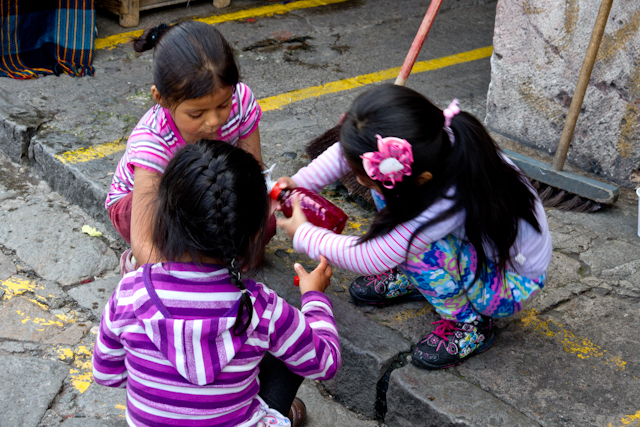 Ecuadorian children are so beautiful - and they find simple ways to entertain themselves while their vendor parents work! 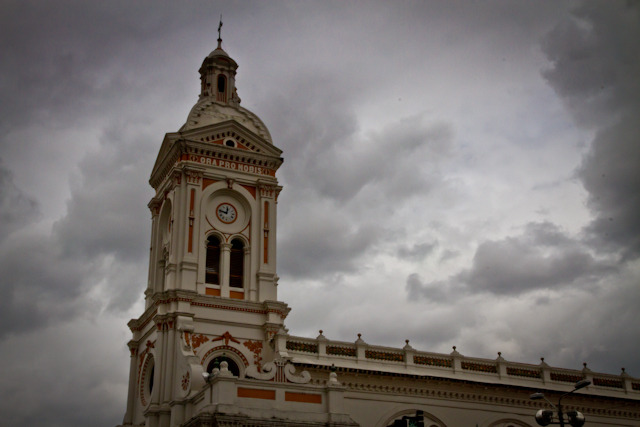 APPLYING FOR A CEDULA IN CUENCA ECUADOR - Applying For Our Cedulas (PART 1) - MORE PAPERWORK!!! Yesterday we decided to walk over to immigration and begin our Cedula process. We wanted to do it last Thursday, after receiving our visas, but it was 3:30 pm, and the guard wouldn't let us through. We invited our friends to walk over with us so they could receive an update on their visa process since their documents were accepted one month prior to ours, and they still hadn't heard anything from immigration. I've blogged over and over again that every person's adventure here will be personal and different. From the day we arrived until this very day, I can only write about what has happened for Bo and me personally. Having our friends with us yesterday at immigration has proven this to be so true. We arrived at immigration at 8:30 am, and I first told the security guard that my friends were here to check on the progress of their visas. He motioned for them to go to the back of the visa line outside that was being checked in by the immigration staff. At this point, Bo and I went to the back area of the immigration office where passports and cedulas are processed. We waited approximately one-half hour before the woman who was to help those with cedulas arrived. The security guard ushered us to her office, and she asked for our passports and birth certificates. She seemed a bit tired, stressed, and disinterested, but my Spanish seemed to lighten the atmosphere, and she even smiled a couple times. We were asked to fill out two applications (one for each, since we were filing with me as Bo's dependent) called, "Datos Para La Cedulacion De Extranjero." Of course, it was all in Spanish, and we were required to answer in Spanish. I didn't take it for granted that I knew exactly what each line was requiring, so I would interrupt her and ask! She seemed very disinterested in her answers, but I made sure I was answering every line exactly as required and not crossing anything out or making any writing errors. I've learned from our past visa process that this is critical! She would peck away with one long-fingernailed-ring-adorned finger every letter required on her end - and it seemed to take forever. At one point her computer system was not responding, and she immediately hollered at her co-worker across from her, "Are there a lot of people.....?" Whatever that meant? She tapped away trying to get into the system, and it would beep. I began to wonder, "Are we going to get through this process today?" Finally, her system was back and she began to ask me questions about where my parents were from, if their name was such-and-such, and so on. Of course, it was right there on my birth certificate, and Bo's, but I guess she was wanting to make sure she put in the correct information on her end. Who knows????? At last, the process finally came to an end. She gave us receipts for both application fees paid ($4 each) and made it a glaring point to let us know we are to report to the OFICINA DEL REGISTRO CIVIL in El Centro next Tuesday and how important it was for us to hold on to these receipts because they would be required when we went to the cedula office to turn in our documents for processing. I immediately grabbed both receipts and filed them away in my folder of "IMPORTANT PAPERS." GEESH! By now I'm exhausted, ready to bolt from the unhappy office of immigration and walk off all our anxiety and head home! Before we leave, we thank her, shake her hand, and I ask her one last question, in Spanish of course, "Can you please do me a favor and tell us what documents we will need for our cedulas?" She quickly turns to her right and asks her co-worker in the booth next to her to answer my question in English. Bo and I leave her booth and pop into her co-worker's booth who is jabbering away at some attorney-like person who sounds like he's defending some important issue he is having with immigration. She interrupts him and he quiets down. I ask her in Spanish about the document requirements and what time the Oficina opens. She paints on a pretentious smile and answers in broken English, "I don't know. You have to go there." I ask her in Spanish, "Can you please tell us anything about the documents required?" She answers again in her broken English, "You have to go there," keeps her fake smile and then turns back to her attorney-like client as if done with us! I turn to Bo and say, "Let's go. She's done with us!" So we walked away. On our way out of the immigration office, a couple we know who are out front waiting to be called to finally receive their pensioner visas begin to ask us about our cedula process. I explain to them a bit of what we just went through, but because they have an attorney working for them I advise them to turn to him since he's handling their entire process. It will be different for them and they already have competent help! We say our goodbyes and head outside to look for our friends. We find them and they do not look happy. Their news is not favorable! We walked back to El Centro together, Bo and I happy that the first step for our cedula process was accomplished, yet concerned for our friends who were quite solemn because of their unexpected news. We tried to encourage them, but by now they were too discouraged and overwhelmed. One of the things I love about my husband is that he's a possibility thinker. He may be one of the most impatient people on earth, but he never looks at situations as hopeless. With him, there's always a solution and always a way! We tried to encourage our friends, but this was not the day they would hear, "It will all work out - it always does." Maybe tomorrow! The four of us headed for the "Oficina Del Registro Civil" in El Centro because Bo and I wanted to immediately find out what documents we needed and when their office opened for our next Tuesday cedula visit there. There was a long line of people standing and waiting inside when we arrived - not sure for what - but I bypassed it by asked the guard where we needed to go for our cedula information. He pointed to the back, and we conveniently found someone at a desk who immediately ushered me to sit and state my case. I asked him specific questions about the documents needed for Tuesday's cedula visit, and he quickly pulled out two application forms called, "Datos Para La Cedulacion De Extranjeros" and another form that listed the many documents required for a cedula. I explained that we already filled out the "Datos..." form, and he said, "Yes, but you have to fill these out AGAIN and have them notarized. You also have to ask the notary for a form called, "Declaracion Junomentada en Base el Formularia." The documents he told us that were required included our apostilled, translated and notarized birth certificates and marriage certificate, notarized copies of our passports and visas, the copies of our $4 cedula receipts, and the "Datos..." forms filled out and notarized, along with the "Declaracion.... form" from the notary office. So, we left the cedula oficina well-informed, also knowing that they open daily at 9 am Monday thru Friday. We walked back to our apartment with our friends, and then we parted ways as they joylessly headed back to their apartment. We felt we had accomplished much in our day, yet our friends walked away heavy-hearted. They expressed they should have gone sooner to immigration to find out what the delay was about their documents, but at least now they knew what was going on. Today, our next "cedula" step was to visit our knowledgeable and efficient translator, have her look over all the required forms and documents and confirm to us exactly what we would need for next week. We were at her office at 9:30 a.m., and she helped us fill out our application forms and pulled from our files all the required documents needed for our cedulas. She will now review and work on the translation of our documents. On Friday we will meet with her to visit the notary and complete this continuing process. Next Tuesday we will appear bright and early at 9 a.m. to submit our documents to the cedula "oficina." WE'RE ALMOST DONE!!!! APPLYING FOR A VISA IN ECUADOR - OUR RESIDENCY VISA OUTCOME - HOW THIS ALL ENDED! On April 26th, Friday, Bo received e-mail notification from the Ministerio de Relaciones Exteriores that our documents were finalized and we were to report to the immigration office on Thursday, May 2nd at 12 noon. Because we had applied for an investment visa residency, we would have to first pick up our original CD certificate from the immigration office and take it to the Banco Central Del Ecuador and have it registered. We were then scheduled to return to immigration between 2 and 4 pm, and then they would finalize our visa stamps in our passports. Of course, we hoped for the best but prepared for the worst. After all, this hasn't been the smoothest process for us, but what else could go wrong to delay what we have been so long waiting for? We grabbed our original passports, $640 cash ($320 each) for our final visa payment, and hopped a bus to immigration. At approximately 12:15 pm they called Bo's name, and we were at the front counter (like old times). This time, we were given our CD certificate and two other forms and told to take them down to El Banco Central and someone would help us there. I specifically asked, "Are there any other forms or information we need to provide to them or just these papers?" I was assured, "Just these papers!" We were delayed getting to Banco Central because we were given wrong bus information by the "Securidad" guard, who assured me when I drilled down on him that he was Cuencano and knew the bus system. Well, we hopped the wrong bus and had to get off quite a distance from the bank, so we ended up walking the rest of the way. When we arrived there, we were told by the machine-gun-toting information man to go to the 2nd floor. There, we were intercepted by the one and only person who could have helped us - he was on his way to lunch with a co-worker. Had we arrived one minute later we would have missed him. Lunch time in Cuenca can run from 1 pm to 3 pm for some. Apparently, he knew we were coming, but because of our delay in getting there due to wrong bus information, he must have figured we weren't coming and decided to take his lunch break. Once in his office, he asked me for a certain form. I questioned him, "What form?" He then showed me a form that was necessary to begin this process. NO! This can't be happening!! Inside I panicked, but I calmly said in Spanish, "Sir, I specifically asked the front desk person at immigration if I needed any other forms but these, and she assured me I didn't! I don't believe they know about this form!" He was silent for a moment, looked at me (probably seeing my distress - I wear my heart on my sleeve) and then replied, "No problem. Let me see your husband's passport. I can still do this." God's favor prevails again!! We sat quietly while he busily began his task of registering our CD certificate. This is to assure we don't withdraw that large sum of money prior to the year it is certified for (all a part of the investment visa residency requirements). At last! He kindly handed us two stamped and signed documents that we were to return to immigration. He told us that we could get the form he required and bring it to him later. I asked, "Sir, is it necessary?" He looked at me, then he shrugged and said, "No. Don't worry. It's not necessary." Go figure!! We smiled, shook his hand and thanked him, and rushed out of there before he changed his mind. Yes, things change here from one moment to the next. When you get favor here, RUN WITH IT!!!! We took a cab back to immigration (by now I was emotionally and physically tired), and returned there at 2 pm. Before approaching the security guard, I quickly glanced at the registered CD documents from the bank man and suddenly noticed that they had spelled Bo's last name wrong, as most people do. LONGWOOD not LONGOOD. Mr. El Banco Central CD Register Man had put in that deadly "W." Knowing how critical it is to have every name correct for the visa process, we looked at each other with dread. Would this mean having to go back to the bank and more visa delays? Bo calmly said, "Maybe they won't notice. Or maybe they will! We'll see what happens." What else could we do? NOTHING at this point. Again, I quietly prayed for God's favor. So, we handed our bank registration documents to the "Securidad" guard, along with our passports, and we began our next wait. There were several ex-pats still in the waiting area chatting amongst themselves, sharing their stories about their attempts to get their visas. I listened awhile but finally ended up tuning most of it out, having already been through it and knowing that eventually most of them too would prevail and be in the same seat we were now sitting in - waiting for that final stamp in our passports. I refused to focus on that "wrong spelling" issue, and now my faith had kicked in. At 3 pm they called Bo's name. We walked up front and were told by one of the front desk women to please go and pay our $320 each at the "Banco" window, then return to her with our payment receipts. She then added, "They are now getting your visa stamps in your passports." WooHoo! I was happy. Could this be it? Would we be walking away with our residency visas, at last? What could possibly go wrong now? Bo and I walked over to the "Banco" window and handed over our money. We got our receipts, walked back to the front desk and were waited on immediately. The immigration woman asked us to sign a form, and then she handed us our passports STAMPED WITH OUR RESIDENCY VISAS. YES! FINALLY!!! Apparently, the wrong spelling on the registered CD form was overlooked (or missed) and we now had our finalized visa passports! We were told to go to the back and begin our Cedula process, but because it was now 3:30 pm, the security guard in the back closed that door on us. He said they closed at 4 pm, and they already had too many people already waiting for services (all three of them). I tried persuading him with my Spanish, but he would not crack a smile or show any emotion. He just said, "No. Come back tomorrow between 8:30 am and noon." So we turned around and left. Applying for our Cedulas can happen any day. We were just content to walk away with our visa stamped passports, knowing that we now can continue living here indefinitely. 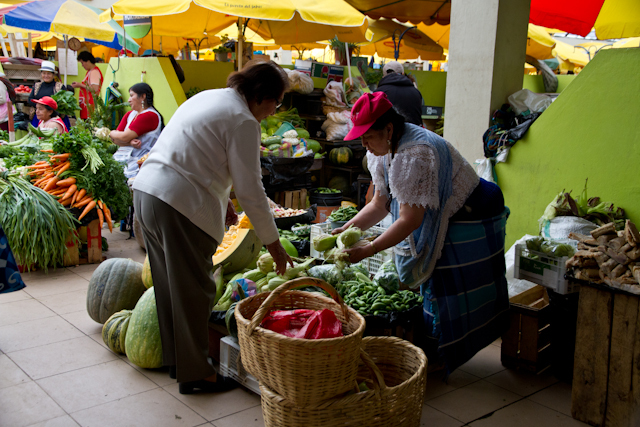 As of today, May 2, 2013, we are able to leave Ecuador for up to 90 days per year (through May 2, 2014). We have to abide by this visa law for two years, and then we are free to come and go as we please. We plan to return to the USA to finalize some things there in the near future. For now, we are going to celebrate this day - always giving God all the glory for His continued favor and victories. 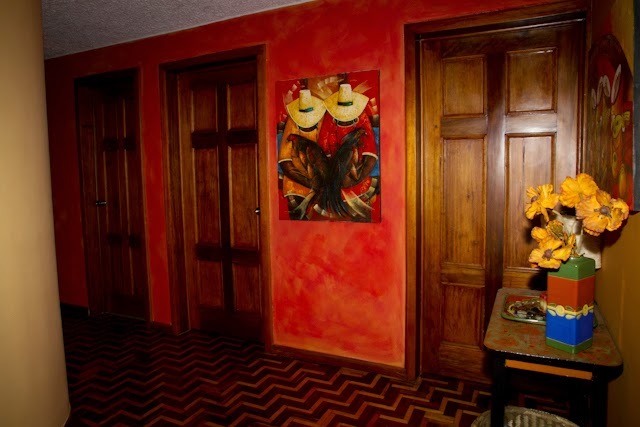 We continue to live here in Cuenca one day at a time, ready for whatever changes present themselves to us. We've been here 5 months now, and we never know what's around the corner. Time will tell! 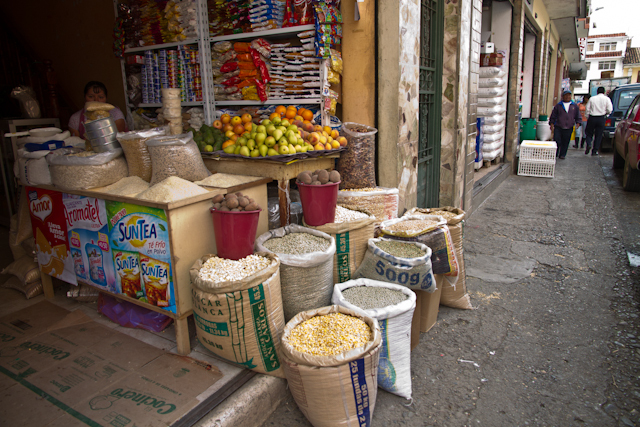 Our "calle" - one block from the mercado! A grain store along our block! 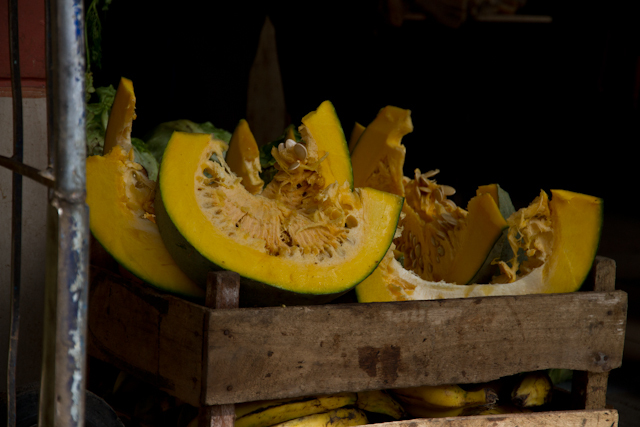 Delicious Squash pieces, ready for sales. I have no idea what this vegetable is! Do you? Cutting up huge and meaty squash. 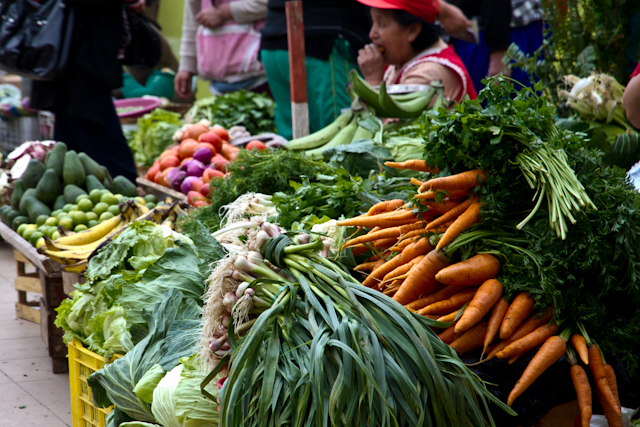 This vendor is munching on her lunch, surrounded by her plethora of fresh vegetables. Some vendors sit and wait while others are busy making their sales. 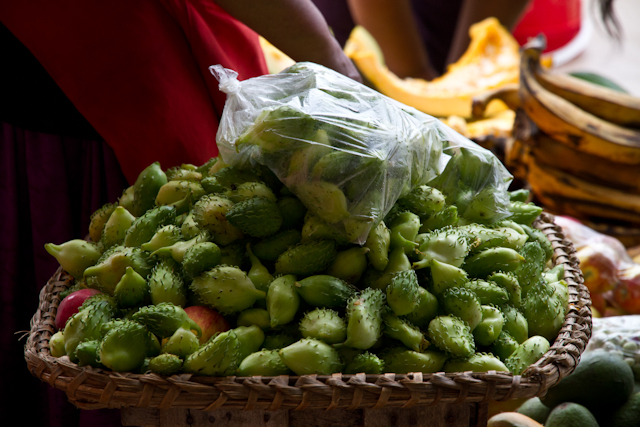 Avacados are huge, meaty, and sell for 20 to 25 cents each. 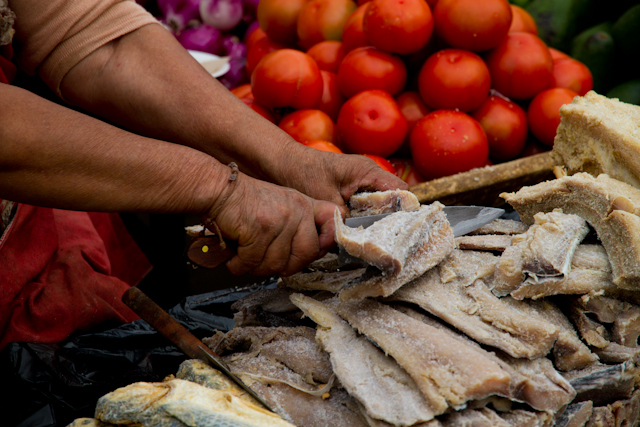 We shop almost daily, find wonderful vendors selling unique and fresh foods (this vendor is cutting Bacalau or Salted Cod Fish), and only have to walk one block to the open market. 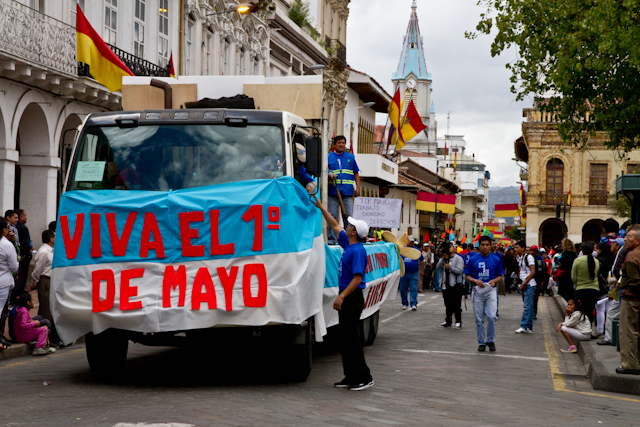 May 1st was International Workers' Day, and the area around El Parque Calderon was crowded with street-lined spectators, the police force of Ecuador and loud chanters with demonstration signs parading along the streets. 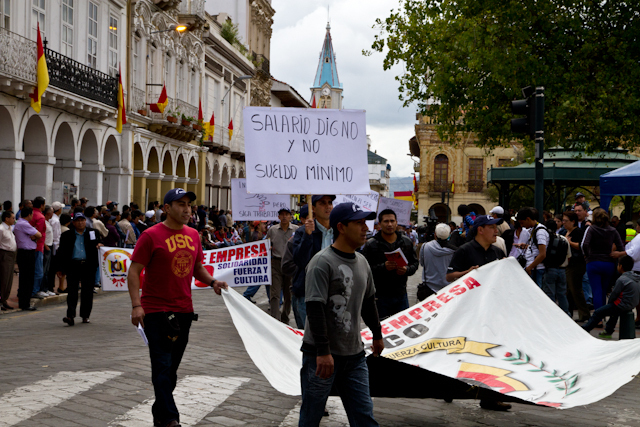 It was a demonstration of opposing workers involving the pro-goverment and opposing government sides - for and against President Rafael Correa. 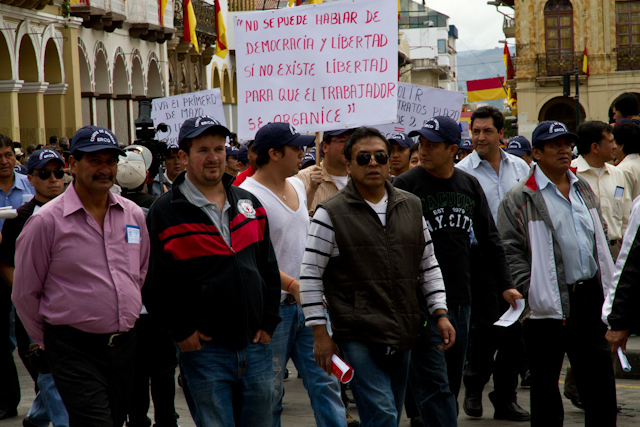 Workers' labor unions protested with signs and slogans criticizing capitalism, imperialism, poverty, and unemployment. 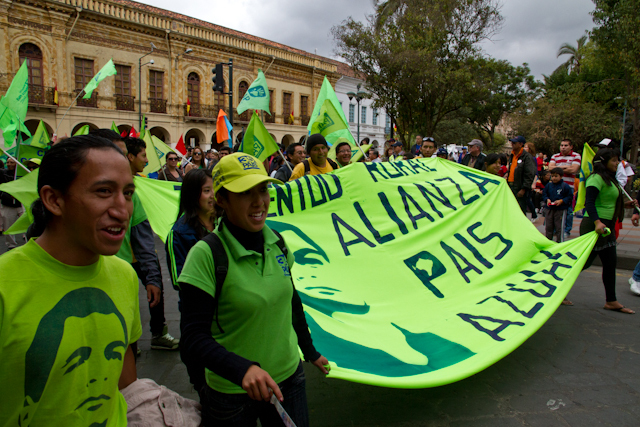 Those who are pro-government defended Correa's changes since his election, especially the lower unemployment rate and rising wages. 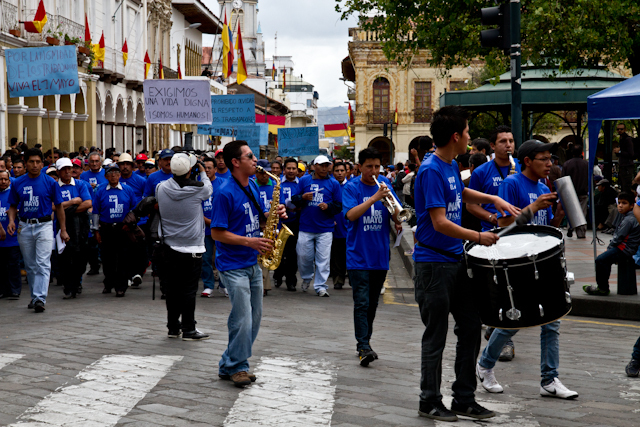 Our friends who live on Simon Bolivar called us in time for me to grab my camera and walk on up to capture this event. Though some ex-pats could not understand what they were loudly chanting about or figure out what their waving signs were protesting against, I was able to understand much. We ran into one of our ex-landlords who began to warn Bo and me to be careful, especially being "Gringos." He said that violence between the opposing parties was bound to happen, and we didn't want to find ourselves in the midst of this. No violence occurred, we stayed for most of the event, and I've captured some interesting street photos of these working-class protesters for those who missed it. This protester's sign reads, "I'm hungry. It's been 4 months since they took my job. Return my things and my Kiosk.... Help me." Protesters chanted loudly as they marched along. 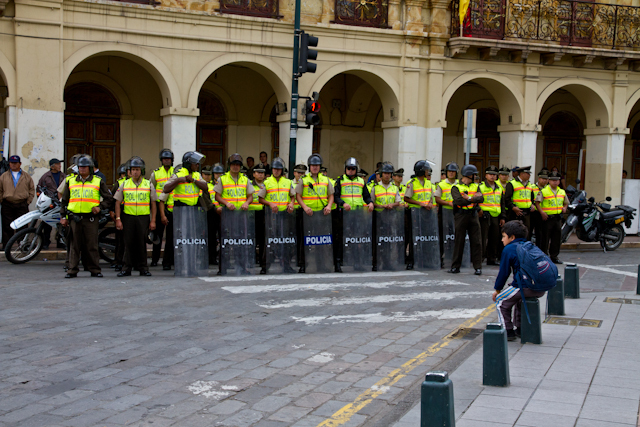 Some of the marchers were directed down Simon Bolivar while others were detoured down Benigno Malo - depending on what side of the government they were on. 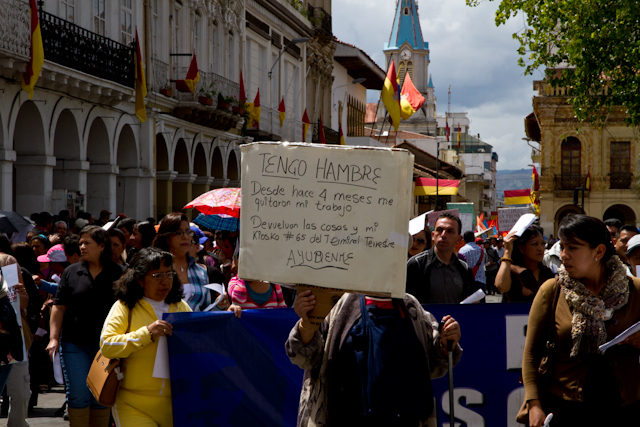 This sign reads, "One can't talk about democracy or liberty if no liberty exists for the worker to organize." 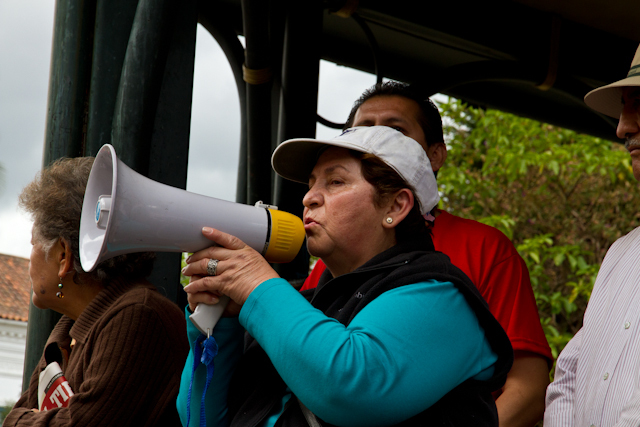 This worker blared her displeasure for workers' rights over this loudspeaker as crowds gathered to listen and cheer her message on. Marchers with bands leading the way held signs that read, "We demand a decent life. We're humans!" These workers signs demand, "Worthy wage and not minimum wage." The innocent were also present. 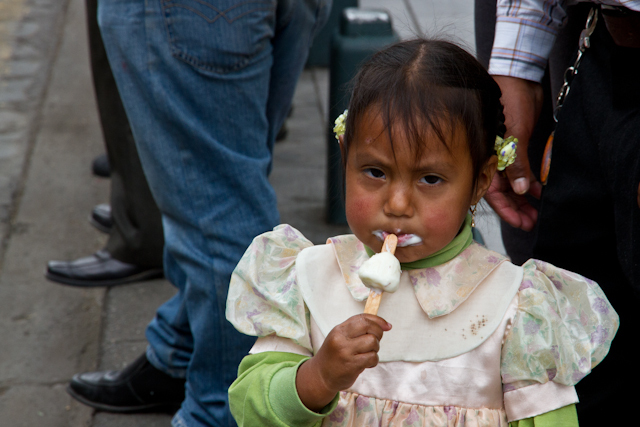 This child was busy downing her ice cream, unaware of what her family is fighting for so she can have a better future. 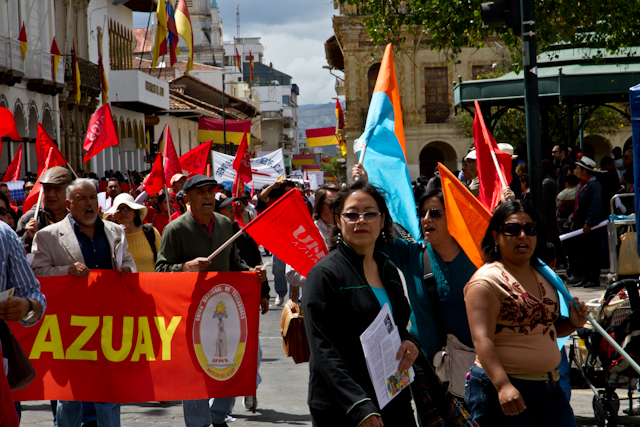 Adults and their families lined the streets of Simon Bolivar. 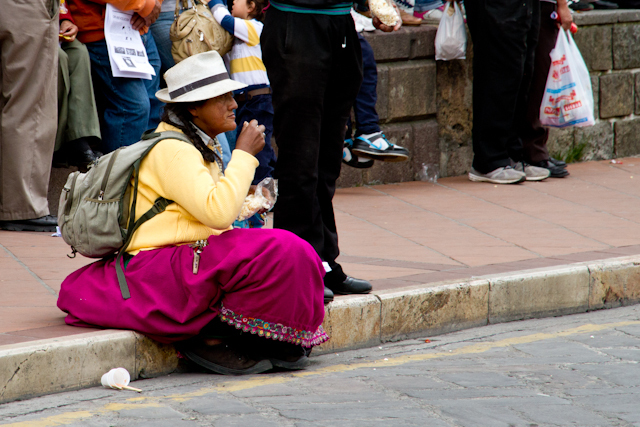 This Ecuadorian woman munches on her salty plantain chips. I watched her and wondered, "What side is she on? 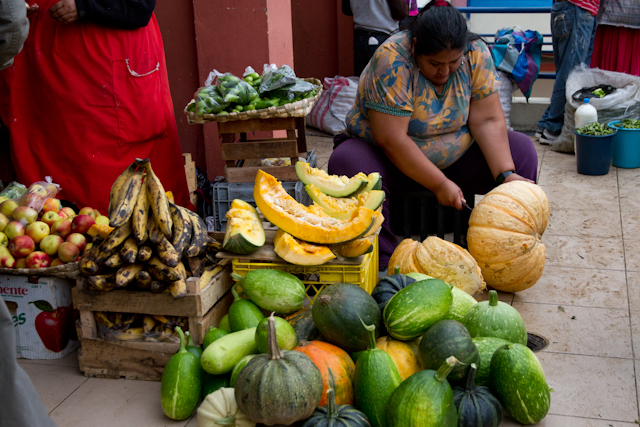 What is her story as one of the hard working vendors of Cuenca?" At one point, the anti-government marching stopped and crowds gathered to listen to the pro-government marchers before they were released to begin marching down the streets. The pro-government workers are released to begin their marching. 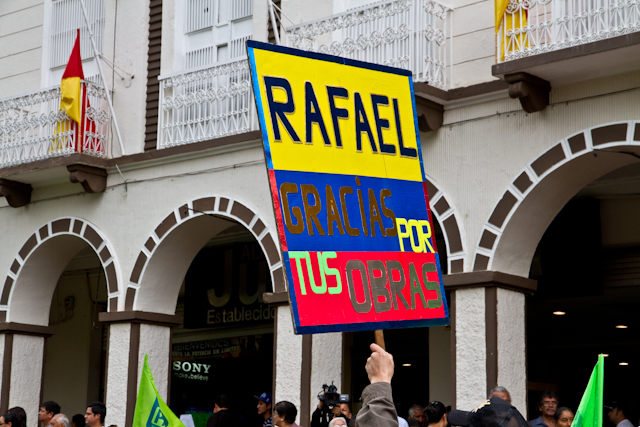 "Rafael (Correa) thank you for your works!" In the park, some are oblivious to the marching and chants of the demonstrators. Bo and I finally head home to continue our day in Cuenca. There is nothing boring about our Cuenca city life!